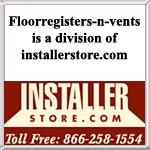 Visitors to our site may sign-up for InstallerStore.com newsletter emails that will announce special product OR product line discounts, as well as new products. Newsletter emails will be sent out intermittently throughout the year. It is NOT our intention to send such emails on a weekly basis. Cancellation of your registration for newsletter emails may be done at any time, simply email us at Sales@FloorRegisters-N-Vents.com with REMOVE in the subject line.